Dimensions 1 by 5 by 8 in. Labor laws and legislation, International. Amazon.com description: Product Description: Over the last two decades or so, a number of developing countries have become important suppliers of manufactured goods. A good deal of these goods are produced under extremely poor working conditions, incompatible with the fundamental rights and freedoms. However, WTO rules do not allow restrictions on imports of such goods, and the ILO hardly ever sanctions violations of international labor standards. On the one hand, this leaves exporting countries free to compromise on labor protection in order to enhance their competitiveness on foreign markets. On the other hand, importing countries are obliged to keep their markets open for goods produced under substandard labor conditions. 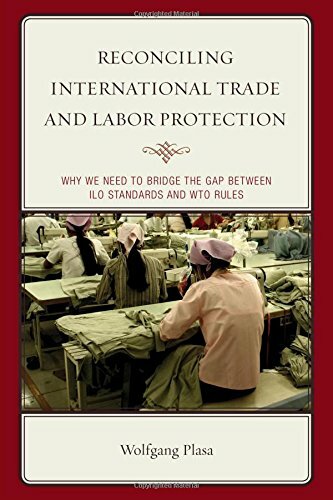 This gives rise to the question of whether the rules of the multilateral trading system should be linked to international labor standards. This study argues that there are two trade-related reasons for establishing such a link. The first one is commonly referred to as social dumping. GATT rules enshrine the principles that should govern international trade: fairness and responsibility. These principles should also apply where trade meets labor protection. Exporting goods made under substandard labor conditions is unfair and distorts trade. It would therefore be consistent to make social dumping actionable. The other reason concerns the responsibility of importing countries. Increased imports of goods produced under substandard labor conditions are an incentive for the exporting country to produce more goods under the same labor conditions, and ship them to the same importing country. This results in a proliferation of violations of labor standards, for which the importing country shares the responsibility. There is a need to adopt a link between trade and labor standards enabling the importing country to cap imports in order to escape the blame.